The Pelican 1440 Top Loader Case with Foam (Silver) is an unbreakable, watertight, airtight, dustproof, chemical-resistant and corrosion-proof hard case used to carry any kind of equipment that needs to be protected from the elements. It is made of ultra high impact structural copolymer that makes it extremely strong and durable. It has a 0.25" (6.4mm) neoprene o-ring, double throw ABS latches that seal perfectly and includes pressure equalization valve for quick equalization after changes in atmospheric pressure. 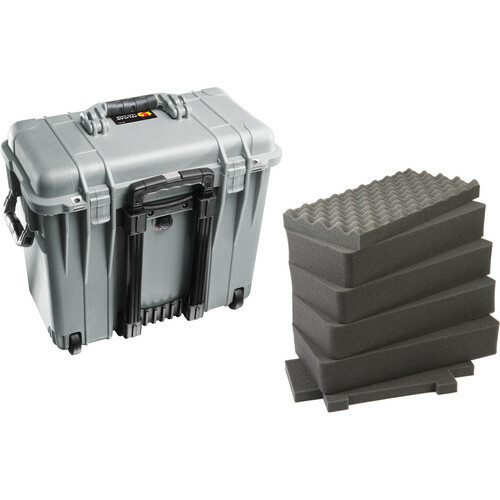 Box Dimensions (LxWxH) 20.0 x 19.2 x 12.0"
1440 Top Loader Case with Foam (Silver) is rated 5.0 out of 5 by 8. Rated 5 out of 5 by Chuck from Worth the money This case is the strong ,light for what it is, balanced, rolls easy and you can add external locks. With several thousands of dollars of equipment in the case its nice to have that option to lock it. The pick and pluck works great just set some time to do it. The to have a case that I dont have to worry about getting knocked over or something stacked on it makes for more time to do what I came to do. Do not hesitate to buy one. You will not be disappointed. Its also nice to know that while pulling equipment in to a shoot in a thunderstorm it will be dry. Even if left outside for 30 mins while things get shuffled around and its on its side. Just dry off the outside of the case. Rated 5 out of 5 by Linear Phase from Awesome Case! It's a Pelican. I put my laptop, audio interface, measurement mic, and all cables etc. in this one case. Rated 5 out of 5 by InDaHouse Productions from Perfect for my new URSA! I bought this to protect my new URSA and it fits like a glove! I trimmed the original packing bottom foam that it came with so it slides into the case perfectly. This is the best case to transport the heavy beast that the ursa is and thanks to the wheels, its rolled around easily. Rated 5 out of 5 by Anonymous from Versatile Case I have both Manfrotto 3066 and 503 Fluid Heads. I've always been toting these heads separately until I thought of the Pelican 1440. Now, I have both fluid heads in 1 case (standing up) and an easy tote for me. Rated 5 out of 5 by Netarx Admin from 1440 Case (Black) by Pelican This is for our sales team to use for hauling the LifeSize HDVideo conferenceing gear. It's easy for all to manage and put in any size car. Very durable and custom to ensure longevity and care to the gear. Rated 5 out of 5 by Anonymous from ANOTHER GREAT PELICAN CASE This is a great case as are the others I have purchased. I use it to store my aerial photos and stereoscope. Pelican is top of the line when it comes to safe storage cases.